Shanthi Gonzales is the incumbent running an uncontested campaign for School Board District 6 director. She is grounded and clear in her priorities. She spoke with passion about parent engagement and currently offers office hours and multiple ways that parents can access her. With that being said, she has also been at the helm of leadership for her district under cuts to schools and programs that most influence and impact our children. With a district that is swamped in administrative blunders and a projected deficit of approximately $20 million for the 2018-2019 school year, Shanthi has a realistic perception of what she’s working with. She started an ad-hoc budget committee and has a strong bird’s-eye perspective on OUSD budget. She speaks of why band-aid solutions are not feasible and wants to root out systemic flaws that milk the system and robs students of a quality education. She advocates for funding to stay closest to the students. Shanthi expressed a commitment to build bridges with other directors based on what is right and just for the students, families and staff. Her sincerity about her responsibility to parents and students is obvious, yet at times inconsistent with her actions. As private charter schools continue to divert desperately needed public resources from public schools, Shanthi has abstained from votes and often voted yes to re-authorize existing, and in some cases seriously problematic charters that are allegedly breaking the law. Expanding charter schools in a district rife with mis-management is an ideal scenario for privatizing public schools. The community needs her to be firm in her position to protect public schools. Shanthi also institutionalized the process for school closures and consolidations with board policy, taking the process almost entirely out of community hands and ensuring a top down district led process for school closures and consolidations. This process inherently places under-resourced schools at a disadvantage. These are the schools for which we need her to be a stronger advocate. 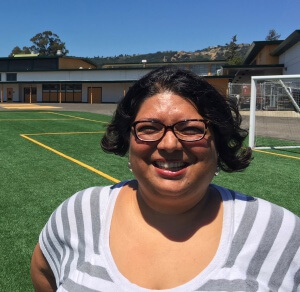 She has our sole endorsement for District 6 School Board Director, but with reservation as the big hurdles within OUSD — fiscal insolvency, expanding charter schools, and school closures/consolidations — require increased determination from current school board members. As OUSD prepares to face continued cuts and changes, it is critical that school board members take more meaningful action to prioritize progressive policies that center the voice of students, parents, teachers and community members.